​TEXAS – For almost a decade, Texas was classified as an 'inbound state,' meaning that more than 55 percent of the moves recorded in Texas were people coming into the stat. However, in 2016, Texas was classified as a 'balanced state' for the first time. Data are from Atlas Van Lines. 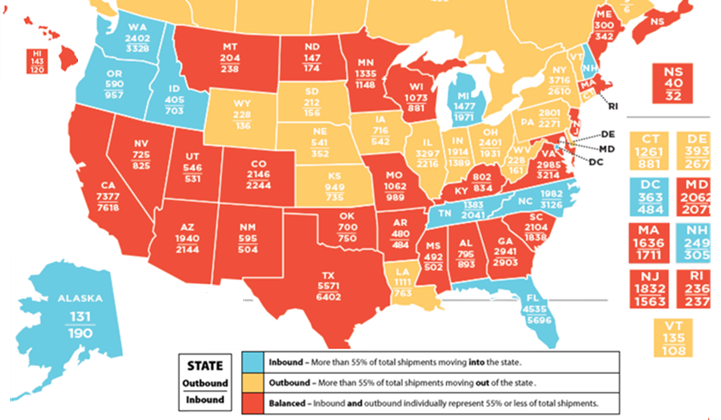 There were still more people that moved to Texas rather than moved from Texas in 2016—6,402 moved in while 5,571 moved out—but the total inbound percentage dropped below 55 percent for the first time since Atlas Van Lines started recording the data. The top reasons for people leaving Texas are the traffic and the scorching summers. But the pros for moving to Texas—gun-friendly laws, strong job growth, cheap land and lower taxes, to name a few—outweigh the cons, the company said.